This unusual and tasty base becomes a crispy crust that lifts easily from the flan dish when cooked. The courgette as part of the fairly traditional filling is tasty, but as an alternative you could easily substitute small florets of lightly steamed broccoli or slices of uncooked tomato. The lentil and onion used for the base reminds me of dhal, a common accompaniment to Indian meals, but without the spices. The crust could take on an Indian flavour if dhal spices were added and a suitable vegetarian filling (or even a meat based one) could be used. Occasionally I have been asked by various schools and churches to submit a favourite recipe to their fundraising cookbook and this has appeared several times. It is a good recipe for a light summer meal and I would certainly serve this, or a variation, when entertaining a vegetarian friend. The original recipe came from Sainsbury’s Healthy Eating Cookbooks: Beans, Nuts & Lentils by the vegetarian food writer Sarah Brown. Tried this especially for my vegetarian niece – the whole family liked it. Thanks! Elaine: Welcome & thank you for adding your recommendation! I am so glad that your family enjoyed this. The lentil crust is slightly unusual but worth the (very little) extra effort. I love this recipe so much, I work in a wholefood restaurant which caters for people who have food intolerances. 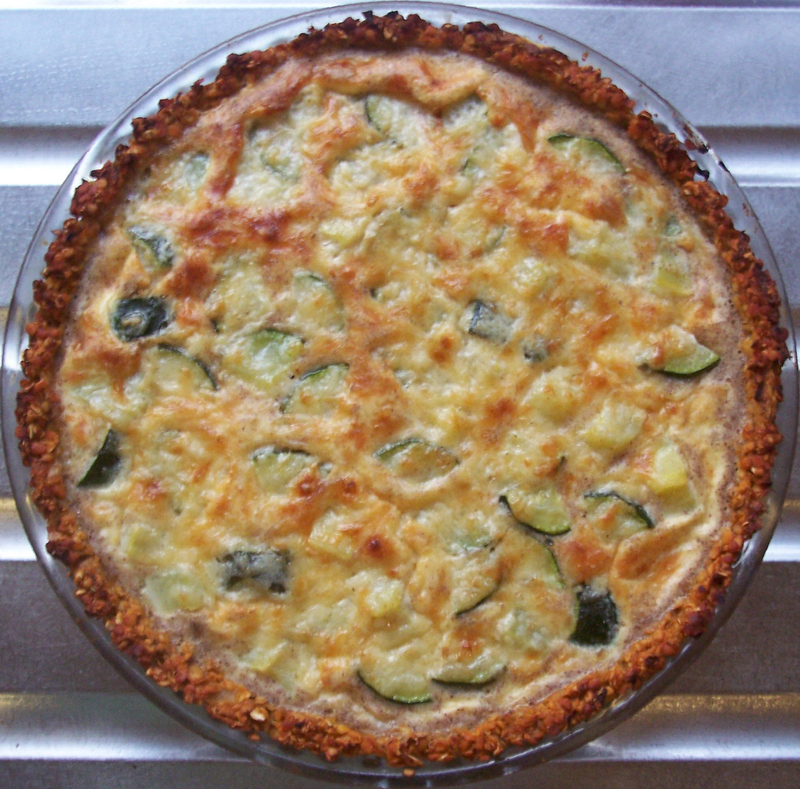 The lentil crust makes this a perfect wheat free tart if you thicken the sauce with cornflour. I’m helping to compile a charity recipe book featuring “climate friendly recipies” and was wondering if we could include this recipe as it is a great vegetarian option and can be easily adapted to use seasonal vegetables. Thank you for visiting my site, Alison. I am so glad that you have found this recipe particularly good for those who have difficulties eating certain food types. By all means reproduce the recipe in your charity book. I wish you every success with the venture. Credit me as your source if you wish, but please remember that the original recipe came from the wonderful Sarah Brown! good shiny morning hope ! your tart was delicious! i only doubled the lentils & oats’ qts, since i had already leftover of 375grs of cooked lentils, prepared according to my mother’s greek recipe (thus, lentils cooked with oil, chopped onion, tomato purée, pinch of cinnamon, sugar, coriander, (sometimes i add pinch of chopped parsley), salt, pepper, 2-3 dried bay leaves- removed at the end of cooking-, splash of balsamic vinegar-1Tsp-). i loved the sweet taste of lentil crust and the salty cheesy taste of filling! Or should i say that this recipe has umami taste? !! Thanks Gina! It is a lovely recipe and one I often make when I have a vegetarian coming to eat. Such a change from boring pastry – and healthier too. I love the sound of the Greek Style lentil mixture and I am sure it made a delicious crust: I must try it your way! Umami? With the sweet/salty/tangy mix you have, I should think definitely! Hello. I am trying to get rid of pulses etc in my cupboard so found your recipe. Didn’t have any lemon so came up with putting coriander in the lentils mixture as it was the most lemony stuff I had. It fits brilliantly and I think it adds extra taste. Also I used crumbled feta and parmesan on top of it, again very tasty. I finished it off with black pepper on top. Welcome Camilla: I like the idea of adding coriander to the lentils – a sort of dhal flavoured crust – good idea! This is a very adaptable recipe. I am glad that you enjoyed it. I had a pingback from the Slimming World message board where the recipe also seems to have been a hit. Hello. Just looked through my cookbook cupboard – looking for this recipe which I last made years ago but I’ve been unable to find my handwritten copy….so glad to find it here!! Thank you. Hello & welcome Sue: I’m glad to have helped find this recipe again – it’s such a useful one to have. About time I made it again too! My mum forwarded me this link, and i plan on making it once i buy a flan dish! Hello & welcome Corinna: I do hope that you enjoy this lovely recipe once you have chosen your dish. Do visit again!